Upgrade your lights and you will be safer and see more when driving at night. We have LED replacement globes in stock to suit most vehicle head lights. 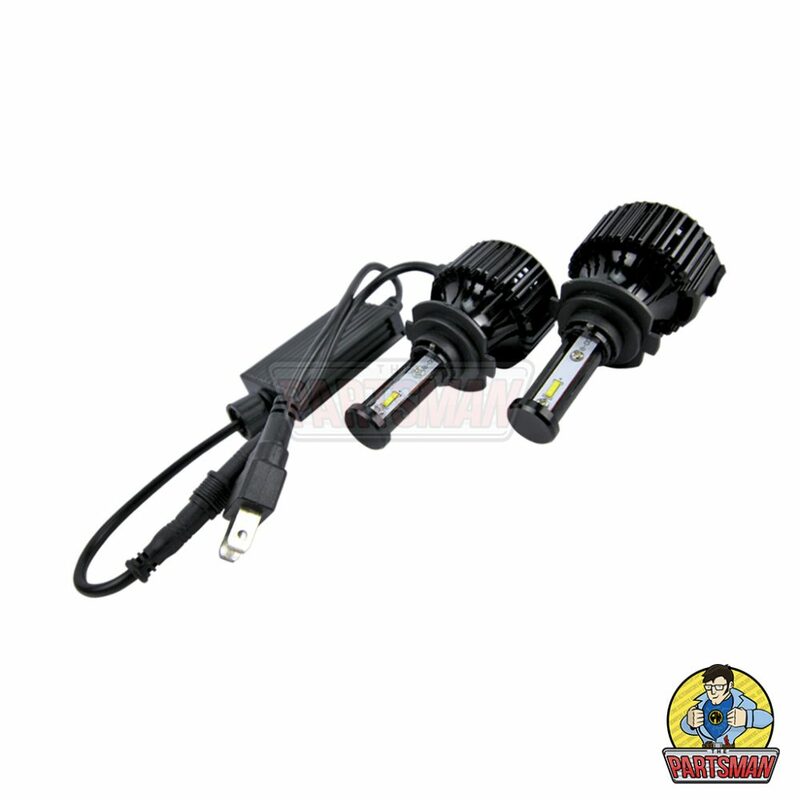 The LED replacement light is not a globe, it is a light emitting diode (LED) controlled by a high powered chip managing voltage, colour and brightness. They are very energy efficient using less power than a halogen globe to emit the same light. They operate on a different part of the light spectrum than their halogen equivalents, resulting in a much whiter light output (close to daylight). Once you have upgraded you will find night driving much safer and less stressful, the difference is significant and very obvious. You will be amazed at the clarity and what you can see now, but more surprised by what you have been missing. Our 100 series globes feature a unique adjustable beam enabling you to focus the beam to best suit your head light and avoid distraction to oncoming vehicles. Featuring a Phillips chip, Japanese made, double ball bearing fan and aircraft grade alloy housing. Using only 45w of power the light emitted from this clever chip exceeds 4800 lumens with a 15,000 hour minimum lifespan. Compare that to a standard H4 halogen globe, lasting only 500-1000 hours drawing 55w and sill only able to produce 1100-1500 lumens. That’s three to four times better output from our LED using 10w less power. Easy to fit, if you can change a head light globe, you can fit an LED upgrade. Simply remove your old globe and replace it with the equivalent LED base, plug the LED into your existing wiring and wait for the sun to go down, then turn night time into day. We stock a large range of LED replacement bases, from H4 to HB4 and lots in between, give us a call 08 8322 5112 or visit our online store and see what you have been missing. Contact us by phone on (08) 8322 5112, email at sales@thepartsman.com.au, or via live chat on our website.